Earlier this week we loaded up all four dogs and went to Calgary for eye testing by a board-certified opthamologist at the Calgary Care Centre. 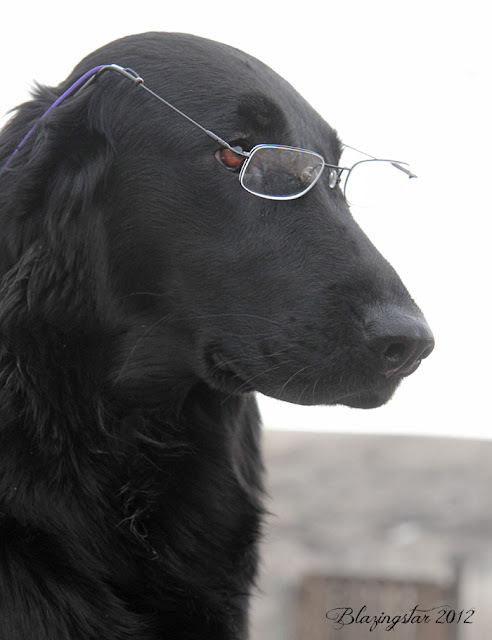 The good news is that all of the dogs passed their CERF (Canine Eye Registration Foundation) exams with flying colours. Puffin and Cava also had the gonioscopy test done (to look at the iridocorneal angle of the eye) and both are unaffected, which is great news. Although Lupine is almost 9 years old, we feel it's important to continue to test our older dogs' eyes when they have been part of our breeding program. Lupine's eyes remain "perfect", which is very reassuring to know! Welcome to Blazingstar Flat-coated Retrievers News. This is replacing the "Results & News" pages on our website - we are hoping it will be easier to update this way. We currently have three dogs living with us at Blazingstar - Cava, Puffin and Larkin.